I recently moved from the City of Hamburg to a smaller, quieter town at the Baltic shores: Luebeck. That’s a better solution for my job at Beneteau since it´s just a 15 minute drive to the marina where I do have my new office and of course to our clients who have their yachts in the water. Luebeck may be smaller than Hamburg, but few people of you may know this one: Luebeck used to be one of the mightiest cities of Europe – with a worldwide recognition in the medieval world. That was because of the German Hanse some 500 years ago. The then unofficial economic capital of Europe experienced an unequalled rise – driven by the unity of a new class of people. 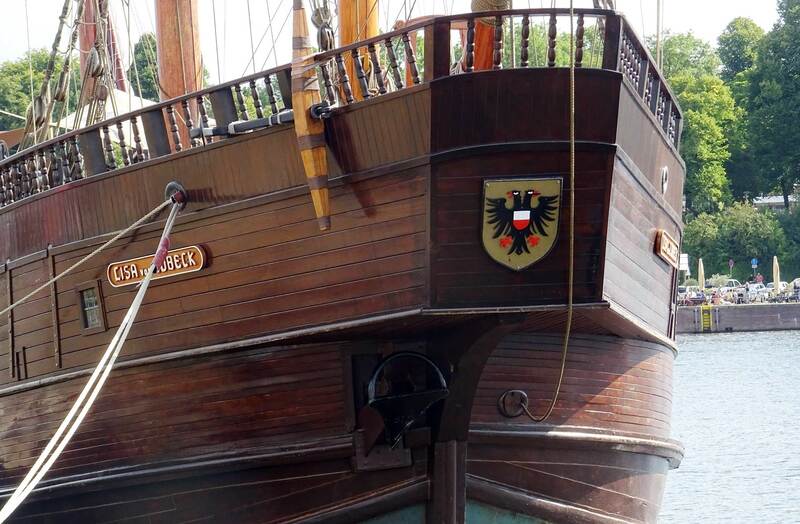 Independent merchants of Luebeck – in the face of piracy and other hardships on their long travels – united under and founded a kind of ride sharing and coach pools: Together it wasn´t just cheaper but compiling whole fleets to set off for a merchant trip to far shores proved far safer. A recipe for winning, as it turned out: Still today Luebeck is proud to have the largest cathedral of the world built not by the cleric gentry but by free citizen. The foundation of the German Hanse was the trade with salted herring (then the one and only known source of durable meat for all of the seafarers of Europe) and – later – of Russian fur. Both of the goods had been exported and imported in huge piles and trades through all of Europe. The German Hanse reached as far East as Nowgorod in Russia, to the West to London, the South to Venice and North to Bergen in Norway. It was covering all of Europe with a spider´s web of trade lines. Propelled by a new mighty type of ships: The cog ship. The merchants built them by the hundreds and developed the cog ship from smaller, one masted boats to bigger, three-masted ships with a load capacity of up to 200 tons. 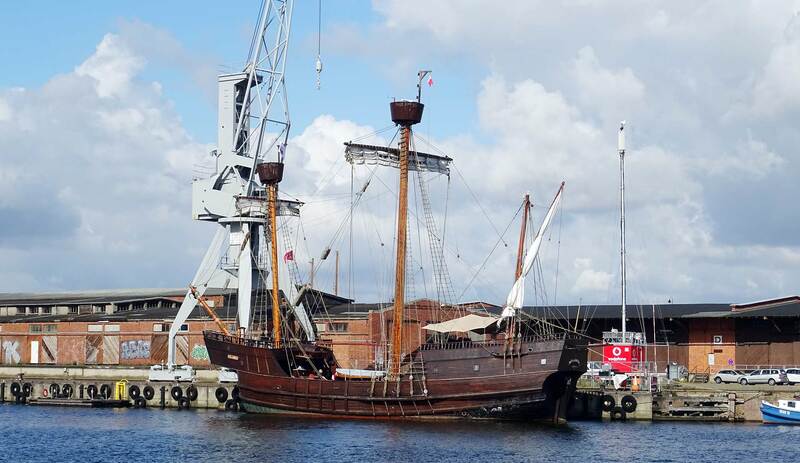 One of those cog ships, the LISA VON LÜBECK can be seen, visited and sailed here in Lübeck. The LISA VON LÜBECK is an example of the later cog ship versions, called Kraweel. People and craftsmen of my new hometown built this boat along original plans, knowledge based on wreckage and by new calculations made by naval architects. 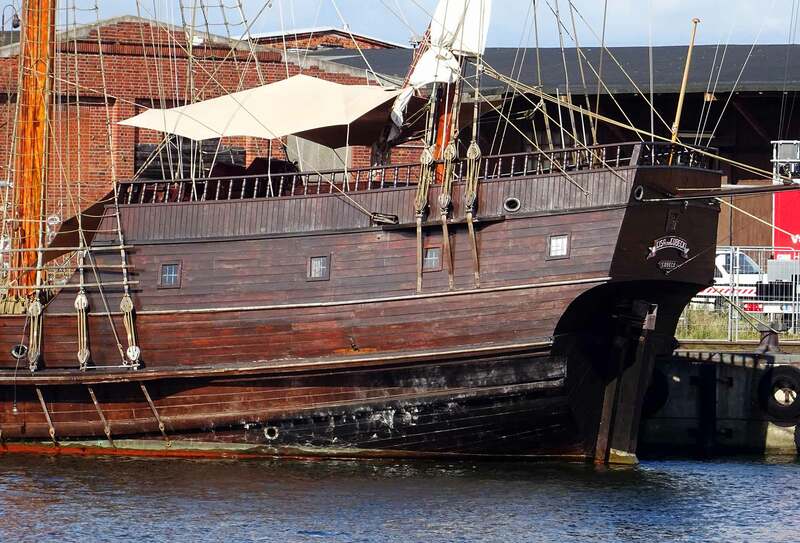 The ship has a length of 36 metres, a waterline of 24 metres and a max beam of 9 metres. Two square sail rigged masts with one mast rigged with a lateen sail sum up to a sail area of 276 suqare metres. She is not a fast ship indeed, but a sturdy ship that can take some shaking up – and carry loads of goods for sure. The LISA VON LÜBECK is sponsored by a large brewery and can be rent for occasions by anyone willing to pay for the ride. 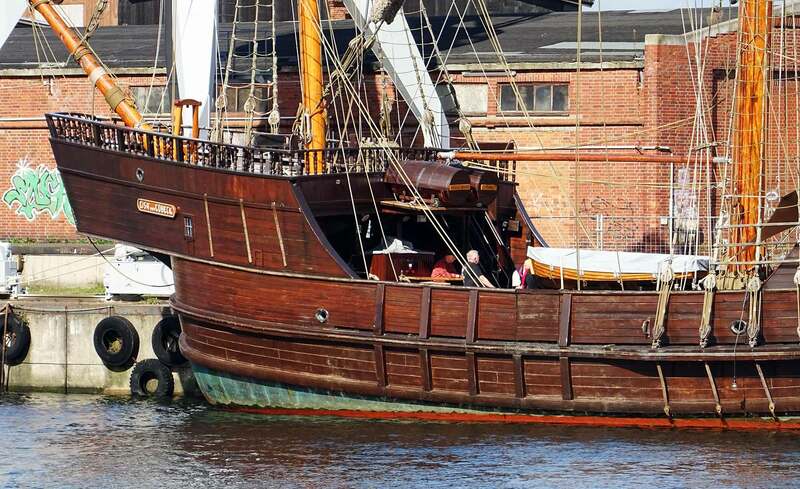 There is also open ship-days and short cruises for visitors. The ship is always a welcomed guest at the big tall ship events all around the Baltic Sea and people recognize her silhouette. But its more. She is a living memory of a rich past of the Baltic area. The German Hanse was – as the Vikings before – a defining power for all of the Baltic states and it still is. Every emblem of any European city bearing the colors white and red may have belonged to the German Hanse. And thus profited from the trade connections of this extra-relational organization. The fleet of cog ships sailed the Baltic Sea to the hundreds carrying a constant stream of foreign goods to the center of Hanseatic Cities, like Luebeck or Hamburg, the ships docked in Gotland, the pivotal Island in the Baltic Sea, reaching as far as London. 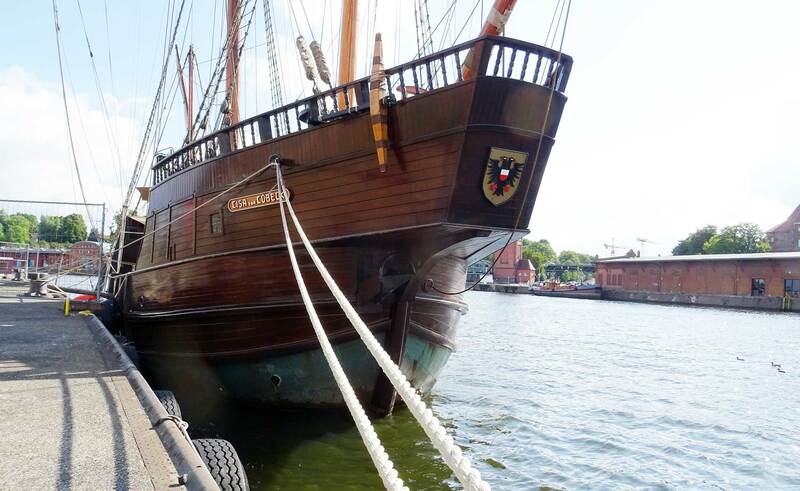 Did you know that one of these ship once carried the Crown of England to Luebeck to be safely reposited as pawn? For me the Baltic Sea is far more than an inland sea. It´s an area with a very, very rich cultural heritage. You don´t need to sail more than 10 hours to reach a new country, to set out for new stories of the past. And the story of the German Hanse, reigning for over 500 years, is what this cultural space is uniting. 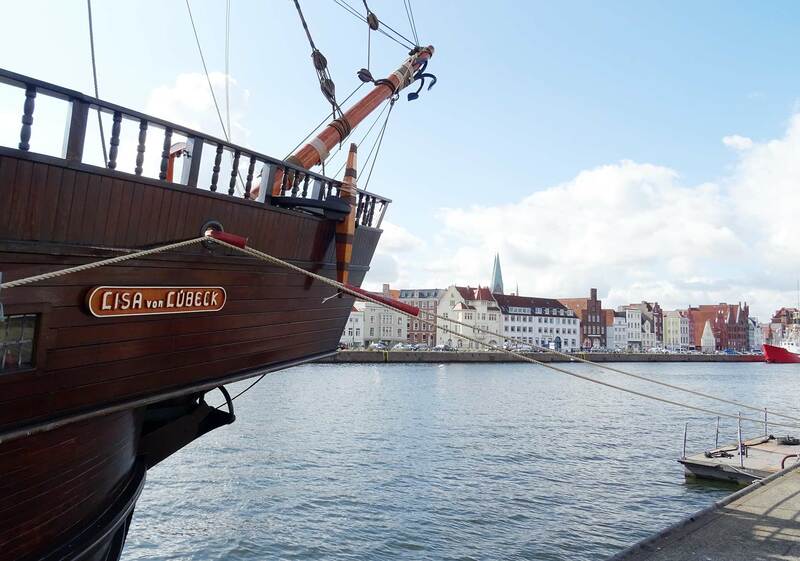 Incorporation of this rich heritage is the cog ship – and I am so fascinated and proud to have the LISA VON LÜBECK mooring alongside the old city´s harbour – a proud symbol of a fascinating past. A proud cog ship for sure! Anyone interested may check their website for departure times and duration of sailing trips. The cog ship is regularly visiting other German and foreign harbors all along the Baltic shores and attending the tall ship festivals like the Hamburg harbor birthday (the biggest of its kind in the world with literally a million of people crowding the waterfront watching a huge parade of 400 ships) or the Kiel Week. You may also enter the boat when docked to have a walk around and see how the craftsmen built this boat with contemporary tools and materials. I found it particularly interesting to walk around this cog ship and dream myself away. And by doing so in getting a kind of connection to the past that is also my past, the history of my country and the history of the area I am living in. I also renewed by intention to sail to the Island of Gotland, once the pivot of Baltic trade. Next Post	Fore Cabin Refit: Which Design fits best?